WOW Halloween Fun Escape 002 is the second episode of this point & click escape game series developed by WOWEscape. 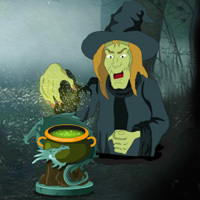 In this game, you are trapped in a witch forest. Your aim is now to escape from there by finding useful objects, hints and by solving puzzles. Click on the objects to interact with. Good luck and have fun! where does the bat go? Sneaky broom by one of the witches, Val.